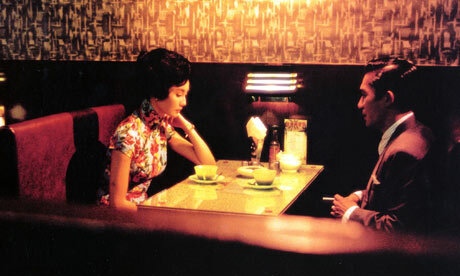 Significant for a number of reasons, 'In the Mood for Love' is not only a great film, routinely voted in polls as one of the best movies of its decade, it also completes Wong Kar-Wai’s decade-long examination of the barriers to human connectivity, a series of now-iconic and influential HK films which includes 'Chungking Express', 'Happy Together', 'Days of Being Wild' and 'Fallen Angels'. It also comes at the end of the millennium, which has the impression of being cinema’s last word on the theme of love and romance in the 20th Century. Part of the allure of the cinema of Wong Kar-Wai is it’s relation to the prevailing action genre in Hong Kong at the time. After the proliferation of John Woo/Jackie Chan-inspired action and kung fu extravaganzas in the '90s, Kar-Wai seemed like the supreme antidote to these overly produced, emotionally excessive exports. In the Mood for Love is like a delicate porcelain doll. With a wisp of a story, the film coasts on the constrained angst of the characters, but always with a supreme cinematic eye, as cool, stylized and memorable as those engrossed action movies. It’s 1962, and here Kar-Wai’s frequent collaborator Tony Leung plays Chow Mo-wan, a journalist looking for an apartment for him and his wife. Same with Su Chan (Maggie Cheung), his comely neighbour, alluring and gorgeous in her 60s bees nest hairdo and form-fitting pattern dresses. But Su’s also married to a man as busy and unavailable as Chow’s wife. Conscious efforts are made not to see the faces of Chow's or Su’s spouses, a commonality the audience subliminally recognizes, thus connecting the two characters together. Gradually through a series of impressively edited montage scenes we learn of an affair between the two spouses. The sequence ends in a magnificent restaurant scene, in which Chow and Su question each other about their respective accessories - Chow’s tie, which resembles the same tie Su gave her husband from abroad, and Su’s bag, which resembles a bag Chow gave his wife. A love affair develops between the two without consummation. Together they vow not to ‘become like their spouses’ and betray their marriages. Kar-Wai turns these screws extra tight as Chow gradually grows fonder of Su, subtly inviting her to consummate their relationship. Thus, Su’s increasing apprehension and teasing love furthers the sadness of their forlorn love. And after a series of time shifts forward into the late '60s where we see a downtrodden Chow return to the same apartment years later looking for Su, Kar-Wai elevates his drama to near-Odyssey-like tragedy. Before In the Mood for Love, Kar-Wai was celebrated for a unique fluid visual style, his camera seemed free to float in and around the busy HK streets at will. But here Kar-Wai consciously sequesters himself in the tight spaces of the cramped apartment space. Even with these limitations he manages to find evocative compositions in which to frame his characters. We never see Chow’s wife but immediately identify her by the semi-circular window overlooking her office. And the frequent meeting place for Su and Chow in the early days of their courtship is simply the landing of the building’s staircase. Kar-Wai maximizes these repeated and simple slow-motion shots with help from the indelible music cue from Shigeru Umebayashi, and of course Christopher Doyle’s lauded cinematography and lighting. It took four years for the follow-up, 2046, to come out and three years after that came his English-language film, My Blueberry Nights. These lengthy intervals suggest perhaps, much like the effect Apocalypse Now had on Francis Coppola’s career, In the Mood for Love exasperated Wong Kar-Wai's remarkable creative juices. I hope this isn't true. In the Mood for Love is available on Blu-ray from The Criterion Collection. Great job providing the context (at least cinematically) in which this film was released. I watched 2046 then In the Mood for Love for the first time recently and couldn't understand why In the Mood for Love was so critically hailed when, in my opinion, 2046 was the vastly superior film. I'll admit I'm in the minority, but I felt 2046 was a more complex and yet simultaneously more emotionally accessible film.